« PVC Play Stations, aviaries, etc! Rico playing on his boing in the aviary. Notice the boing is hanging from a ceiling protector. We had another great meeting last week. We discussed many things including a review of our first field excursion which took us to Hartman Aviaries. We discussed ways to better serve the companion parrot community in NW Ohio and how to share this information with people involved from all over the world on our FaceBook page. Our topic of discussion was building things such as aviaries, play systems, and toys from PVC. We discussed tools to use, such as the PVC pipe cutters, the PVC primer and glue. The connectors such as T’s, 90 degree elbows, crosses, and end caps. We’ve learned from a poster here on our blog, that if we are building things from PVC that are to be used outside, we may want to use the grey PVC because it is more durable in constant exposure of the sun and other elements. What a great tip and we thank you for that information. PVC comes in different sizes and can be used in larger sizes for ceiling protectors. Ceiling protectors hang from the ceiling and are big enough that the bird can’t get their feel around them. Their intention in use is to keep them from being able from reaching the ceiling and destroying it. I have ceiling protectors all over the bird room in which my 9′ play systems hang. 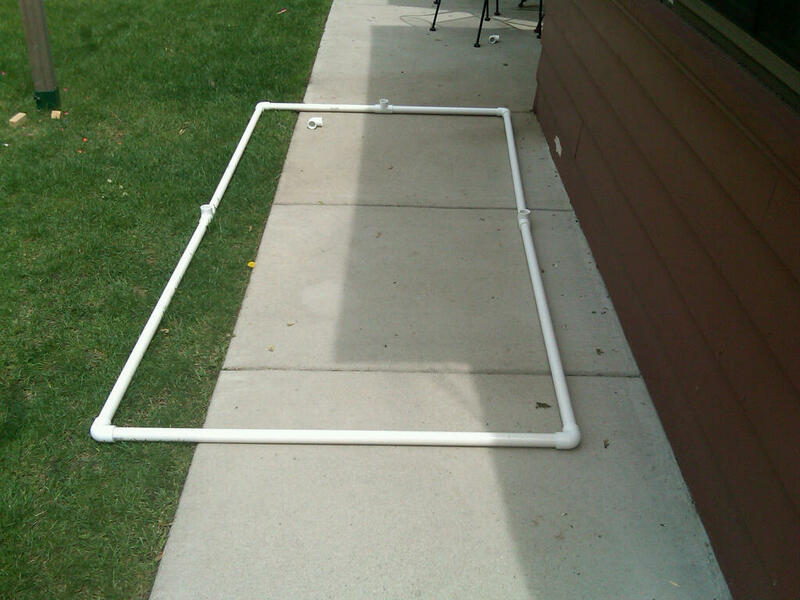 I make the play systems from 1″ PVC. The ceiling protectors from 2″ PVC. 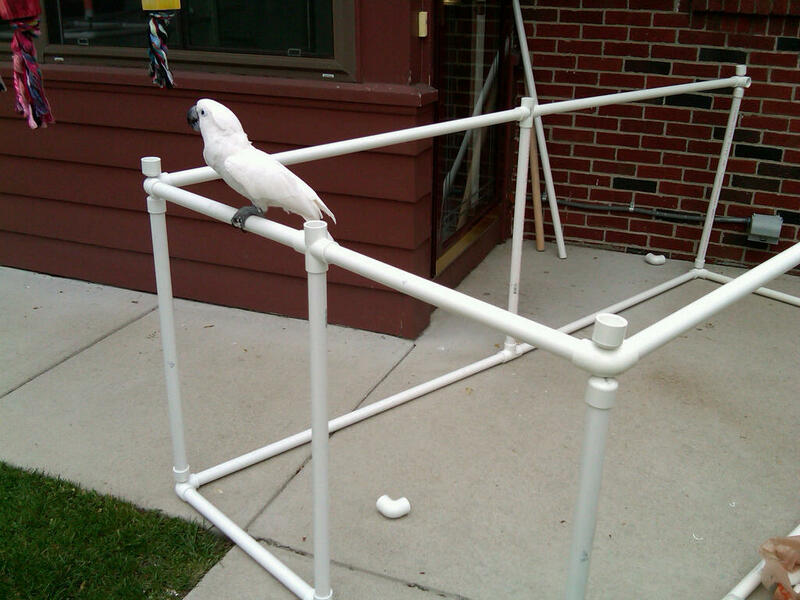 Smaller bird gyms from 1/2″ PVC and then wrap it in vet wrap so they get a better grip. Aviaries are one of the best forms of enrichment I have found to offer my birds. So much so that I have enclosed my whole back yard as an aviary so the birds can fly out the door and into and around the aviary. This summer I built another aviary inside the aviary for numerous reasons. Here are a few photos showing the construction of this aviary that I build from PVC, metal wire, and put together with PVC glue and zip ties. Accurate measurement is key. Keep a pen and paper and be consistent with measurements. I use a fine tip sharpie to mark on the PVC pipe. I write the exact measurement on each piece. It helps for quick reference when building symmetrical objects, objects of equal size. 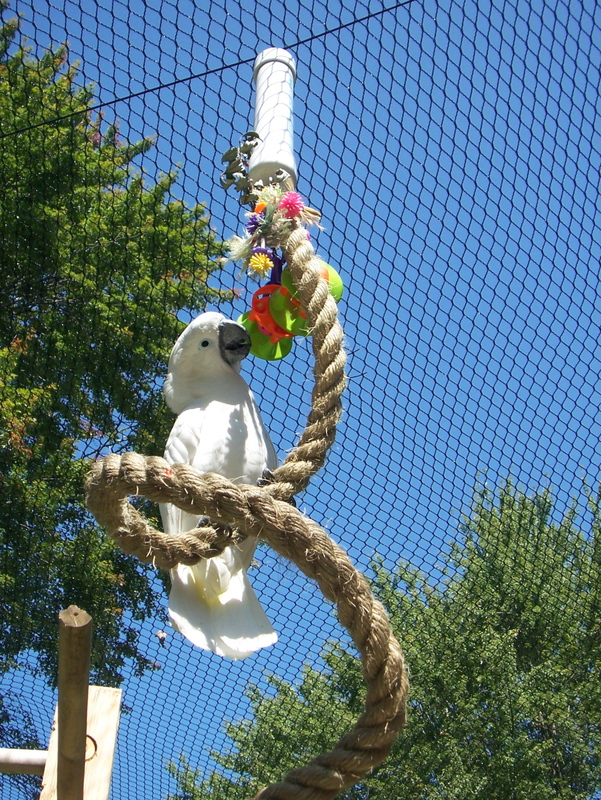 The aviary I chose to build is 103″ wide, 49″ deep, and 59″ tall. This size fits numerous areas of my back yard. I chose to build it from PVC to keep it light weight and mobile since I am the one moving it by myself most of the time. I started with the base and then built the aviary in two sections from there up. Each corner has a 90 degree elbow. If you can tell on both sides in the middle there are 2 T’s. This allows for the height of the aviary to start being built. Here is the framed in bottom half of the aviary. Can you see all of the connections and sections of the PVC? On each individual piece of PVC, I wrote the length of the PVC pipe. 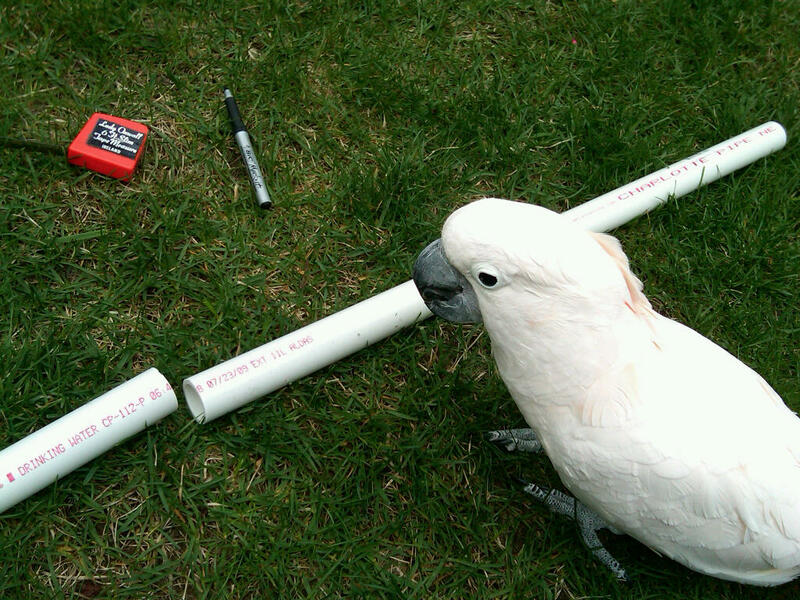 My Umbrella Cockatoo is small for an Umbrella, but you cans see how his feet fit the size of this pipe. This is not of concern to me in building this aviary since he won’t be perching on the framing, but if I were to be using it for perching purposes, you can see how well the 1″ pipe fits the size of the feet of this size bird. If I were making this for perching purposes, I would also wrap this in vet wrap so the bird can get a sturdy grip on the pipe and walk confidently without falling off. Top and bottom sections framed and metal wire being attached to bottom portion. After framing in the bottom section, I framed in the top. I then began attaching the metal wire. I wrapped it along the bottom and then with a separate piece, I wrapped it around the top. I attached all of the metal to the PVC pipe with plastic zip ties. All of these items should be available at your local hardware store. I chose to use plastic zip ties because it was the safest thing I could find. It was suggested to buy metal hog clamps but they looked like toxic metal for the birds and I know an intricate device like the hog clamp would look like a toy to my birds. I chose plastic zip ties because they were easy to use, inexpensive, and could be easily replaced. They worked out great and still are. In the photo to the right, you can also see where I left the opening for the door. I framed in the door separately and added it last. As far as what type of metal to use for the wire, I suggest doing your research on stainless steel mesh. That will be pretty expensive but the safest way to go as far as using metal and avoiding chances of metal toxicity. I would also check for the gauge of the wire. The lower the number such as 12 vs. 16, the stronger. 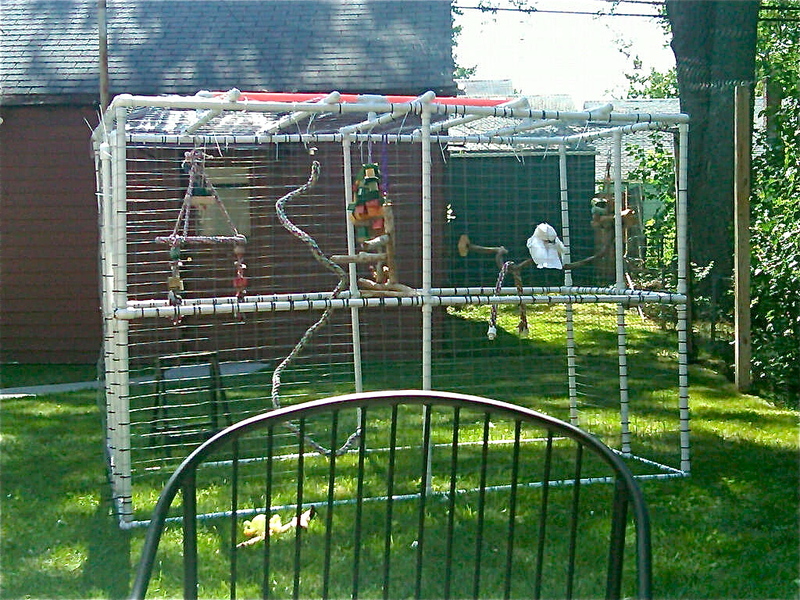 On this aviary I used a wire that is almost too flimsy. It works but I will eventually have to replace it with a heavier gauge wire for durability. Also pay attention to the size of the openings you want on the wire. This is important because this is where you have to attach a lot of perches from the side. Finished aviary with completed door. In this photo on the left, you will see all of the PVC pieces I put from left to right on the top of the aviary. I did this with intention to hang toys from them. It also helps in the support of the structure and makes it very durable for weight from the inside and the weight of numerous birds on top of it. I paid close attention to not over packing the aviary full of toys and boings. 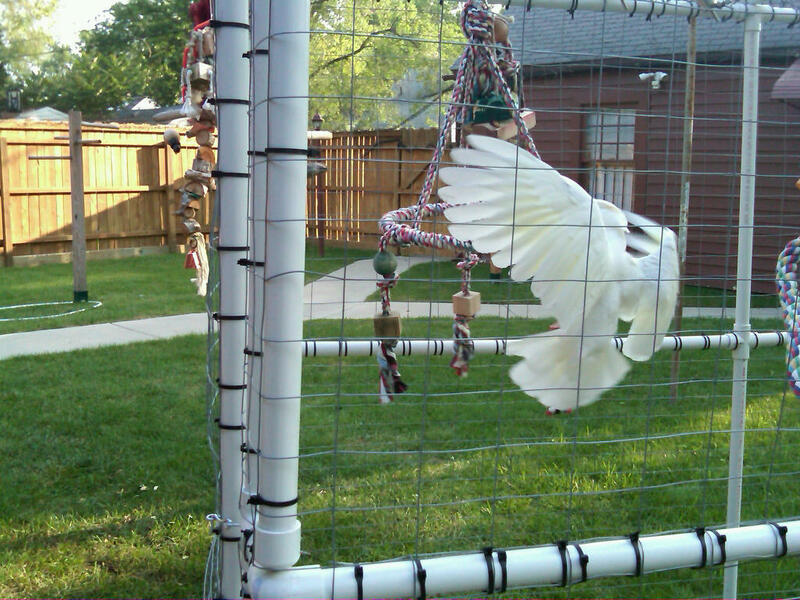 I watched my birds interact inside and added toys and perches as I saw them needing them. One thing I ended up observing was how much they enjoyed the amount of wing space enclosed. Rico, my Umbrella loves to hang upside down and seems to really enjoy flapping his wings. He also gets very vocal while doing this which allows for great enrichment for me too. Rico enjoying the amount of space inside his new aviary. The birds show obvious signs of enjoying the aviary and all that it provides to the. It provides fresh air, natural sunlight, a constantly changing environment full of visual and audible changes. It gives them a change in their environment from indoors to outdoors. I would also suggest keeping an eye on your birds at all times while in their aviaries. You can never be too careful. Also pay close attention and always provide an area for your bird to get out of the sun. I provide this in moving the aviary around the back yard throughout the day depending on where the trees cast shadows. Enjoying an afternoon in the aviary. Please feel free to ask questions. We will be adding additional information soon along with additional photos. When using the PVC glue, use it in outdoor areas that are well ventilated. Use away from your birds. The fumes from this glue are very strong and very dangerous to your bird. Allow for the glue to thoroughly dry before allowing your bird anywhere near the glued pieces. Also try to wipe off any excess glue to prevent the exploration of curious birds. More photos will be added. Pet Supplies Plus has donated $100 worth of gift certificates to the Parrot Society of NW Ohio. We have chose to offer these as four prizes for our next meeting which is September 13th. Our members have the opportunity to make and present four inventions from PVC. The four winners will receive a $25 gift certificate to Pet Supplies Plus. Good article, I was just wondering what you use as far as water dishes? Also do you provide feed for them when they are out side in the aviary? 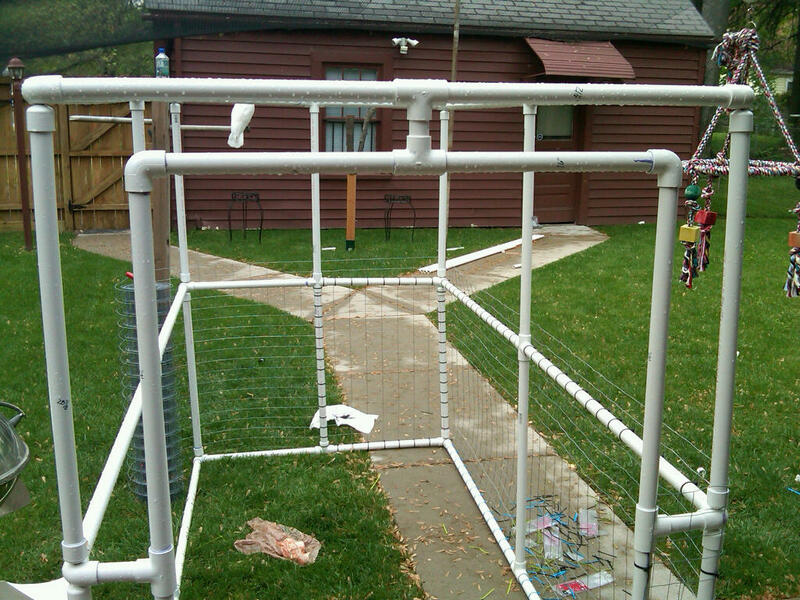 On the different play gyms, play systems, or different stands I make from PVC, I will use a larger (3″) PVC end cap as a water dish. In something like this aviary, you could easily use one of the acrylic dishes purchased from a pet store that has the base that screw onto the side of the cage. In the aviary, I do have a foraging toy that I’ll load with almonds or other dry favored treats. I keep a close eye on feeding the birds outdoors. It attracts squirrels and flies. If I feed outdoors, I offer the food until they are finished eating and then I take it back indoors. This is just how I personally prefer to feed outdoors. what type of wire are you using? Ive had a hard time finding something safe for parrots. Please tell me exactly, where you bought it – what size, name brand ect. That is a great question Brian. I haven’t found a wire mesh yet that I really like. I’ll be in search for more this spring and would be more than happy to share once I find it. I know I’ve heard about scrubbing galvanized with vinegar but I don’t feel comfortable with that. Also, what do you feel about the powder coated dog kennels? I was thinking of buying one of those with the roofs?? I’ve looked into the stainless steel mesh also and found it very pricey. I’ve been doing a lot of research on my metals for additional aviaries. In this photo you are referring to, the netting is a poly netting. Here is a blog post with detailed info on where to find it and how I build this particular aviary. http://larajoseph.wordpress.com/2009/06/21/44/ My whole backyard is enclosed in this netting. I have two cockatoos, a macaw, and an eclectus. None bother the netting. I just need to make sure what I keep inside the aviary is more exciting than the netting. It’s not something to leave the birds in unattended. Its not predator proof. Hi and welcome to our blog. Actually, all of the step by step instructions, detail, and tools used can be found on my website which is located here: http://www.larajoseph.com/LaraJoseph/pvc_aviary.html. Hey, greAT post! We want to build our African Gray an aviary for the pool patio (screened in and partially shaded) here in Florida but the choice of wire mesh is critical, as they can bend metal housekeys with their beaks and are, of course very sensitive to coatings. Have you come up with any new ideas since posting this earlier in the year? I see you sent me an e-mail too. I have a link I’m going to send you for the wire. Show photos when you can Kelli. I know another member is building an aviary for budgies also. Excited to see! Thank you very much for your way but before I started. I just bought plastic zip ties. I have tighted one zip tie around the mesh of the small cage which we have at home where poor amazon is living to see the strength of the tie but 😦 within one minute the tie was cut by the amazon. 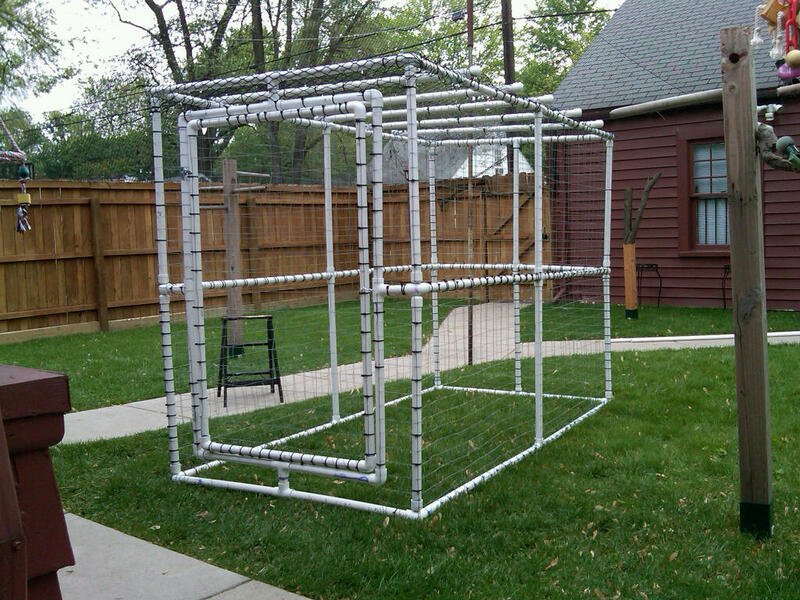 I became so sad because I was so happy to use pvc and ties for making huge cage. What should I do. A lot of birds will find the zip ties as enrichment. This is why there were so many zip ties on this cage. Something else you may want to try is offering the zip ties on toys easier for your bird to get to than biting them off of the cage. There may be other ways to attach the caging to the structure. If you choose to find other forms of attachments, make sure they are bird safe. Please don’t hesitate to let us know if you have any questions.